The latest addition to the ever evolving DYNAIR® range of products is the DRV range of Energy Recovery Ventilators. 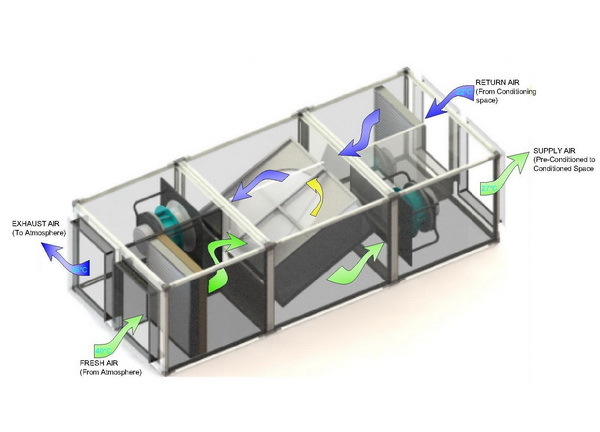 For more info on Dynair Energy Recovery Ventilator, Please Download Catalogue Here! Help to maintain low energy costs & reduce overall energy consumption. Higher moisture in the air stream of a building can provoke mold, allergies & micro-bacterial growth, Dynair DRV can improve de-humidification with package, unitary, split, window or local air-conditioning by introducing fresh air (From outside), is the basic idea to dilute air contaminants (Which are developed automatically inside the building) & to achieve acceptable indoor air quality. DRV are with air to air rotary enthalpy wheel, high efficiency & low noise Fans, Filter with high Arrestance efficiency as per EN 779. DRV series 300/600: With SISW backward curved fans to ensure the lowest possible sound and to develop ample static pressure. Durable external rotor motor provided with non-self­resetting thermal cut out. Fan and motor assembly balanced for quiet and vibration free operation. DRV Series 900 to 2000: With Highly efficient plug fans of the centrifugal series, directly connected to EC motor, which are principally intended for operation without scroll housing with low energy consumption. Complete motor/fan unit statically and dynamically balanced. The welded impellers with their backward curved blades are made of aluminium as this minimizes the bearing load of the motors and maximises durability with high rotational velocity. The position of the impellers on the EC external-rotor motors has been optimised too in terms of aerodynamics and installa­tion requirements. DRV series 3000 to 7000: With either belt driven DIDW forward curved or backward curved fans which are AMCA certified for Sound and Performance with class F, IP 55, TEFC motor as per IFC 600034, and IEC 60072. DRV 300 & 600: Complete GI construction (Single Skin) with 2 mm thick sheet, epoxy coated. Compact, inherently stable housing. DRV 900 to 2000: Pentapost design & have strong three way angle joints of reinforced nylon corners to form a rigid frame structure. Rigid frame work comprises an assembly of externally chamfered extruded aluminium profile & nylon corner joints. Standard Per Coated GI sheet 0.8 mm. DRV 4000 to 7000: Pentapost design and have strong three way angel joints of reinforced nylon corners to form a rigid frame structure. Rigid frame work comprises an assembly of externally chamfered extruded aluminium profile and nylon corner joint, double skin- inner and outer skin Pre Coated 0.8 mm and 0.8 mm GI as inner. DRV 300 to 2000: 20mm CFC & HCFC free Closed Cell closed link with thermal conductivity of 0.034 W/mk @24°C, density 30 kg/m3. DRV 4000 to 7000: Double Skin 25 mm fiber glass insulation with a density of 48 kg/m3 and thermal conductivity of 0.031 W/m.k @ 25°C. Note: Above thermal property based on certain temperature and only the insulation without casing skin material & Subject to change with testing variance. 3) View port and marine light. 6) Double Skin – DRV 900 to 2000 (Except 300 & 600).